For the last few years dmexco, the international digital marketing conference, has made waves by focussing on digital transformation and innovation, and this week is set to be no different. As digital has become critical for brands today, the conference has evolved from its German roots to have global reach, with an expected audience of 50,000+ and 1,000 exhibitors filling the 90,000 sqm exhibition hall in Cologne. As a global digital marketing agency, Isobar attends this key conference to meet platform and technology partners, clients and talent and discuss what defines the business potential of tomorrow. The conference is also a chance for Isobar to showcase and discuss our latest innovative thinking. This year, our activity falls into three branches of digital that are on the minds of marketers today: Digital Natives & Brand Commerce, Innovating the Last Mile & the opportunity for AI-enabled Voice. 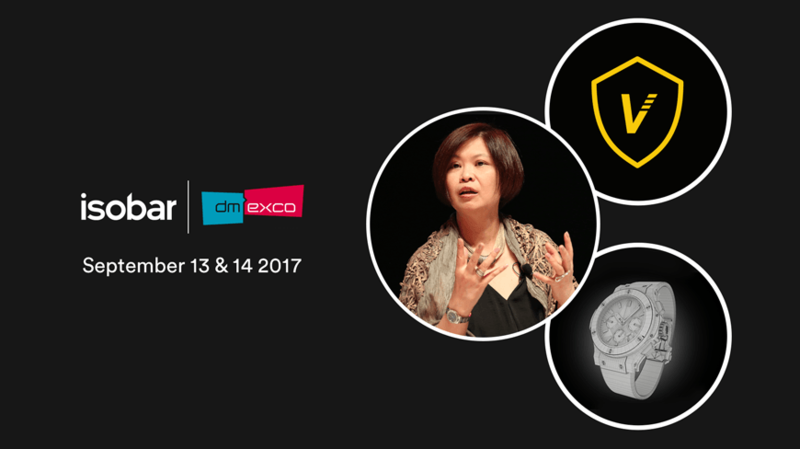 Jean Lin, Isobar’s Global CEO, will be taking to the Debate Hall stage with Kris Beyens, VP Operations EMEA, eBay, on Thursday 14th September at 14:35pm to discuss Brand Commerce: Transforming the shopping experience for Digital Natives. The discussion will be moderated by Bernhard Glock, Senior Vice President, Medialink, and will focus on the future of shopping. Expect to hear how brands and businesses are organising themselves to solve the complex business challenges we face today, and how, in a connected world of products, services, and marketing, we need creativity to drive digital strength and shareholder value. In the Dentsu Aegis Network booth in Hall 6 D-021 (close to Spotify) blue-infinity Linked by Isobar will showcase the ‘Connected Frame’, a retail innovation created in partnership with the long standing partner, Hublot. The case offers customers an enhanced brand experience, integrated and customised at each point of contact using virtual reality. When Hublot’s customers slide their arm under the display case, the innovation retransmits all the user's movements, in real time, reproducing a 3D holographic image of their wrist, wearing the watch model of their choice. It also offers a smart solution to the issues of stock and security. Wonder what it looks like to have a luxury watch on your wrist? Come to the booth to try it out. Isobar will also showcase the ‘Voice Assistant’, the latest Amazon Alexa innovation prototype by Isobar’s international innovation accelerator Isobar Nowlab at the Dentsu Aegis Network booth. Built by Isobar's Global team, eCommera Linked by Isobar, and Isobar US, the innovation tests the opportunity for brands and voice, and pushes the boundaries of technology and creativity to enable brand commerce, integrating a smart mirror, Salesforce Commerce Cloud and an exclusively developed Alexa skill to close the gap between brand inspiration and transaction. Guests at the booth will be invited to “shop” or “discover” an exclusive new sportswear brand collection using the innovation. Stay up to date with Isobar's presence at dmexco by following @Isobar on Twitter.